I have a big thank you going out to my friends at Sojos! They sent me some tasty delights this week to try out and review. Today it is all about Sojos Complete Turkey Dog Food Mix. Oh, I love me some turkey! Because this is a raw dog food, I want to recap Mom’s conversation about guidelines with our veterinarian food therapist, Dr. Judy Morgan. I normally eat a home-cooked primarily organic diet, so this is a bit of a change. Dr. Morgan believes the ingredients in Sojos Complete Turkey Dog Food Mix are along the same lines I’m used to getting, and she didn’t think the fact that it was a raw diet would bother me. She just wanted to confirm that Mom would continue to give me my regular probiotics and supplements. The other precaution Mom took (she can be a bit of a germaphobe) was that she made me eat my food on a towel and washed the towel when I was done eating. So there you have it. Now back to my review. Mom mixed up the Sojos per the package instructions (just add water and wait 15 minutes). Yes, that’s it. Pretty easy to make a healthy dog food! After my 15 minutes of patient waiting, Mom gave me my first taste. As soon as my lips hit the bowl, I knew I was in for a delightful taste treat. Oh, wow! 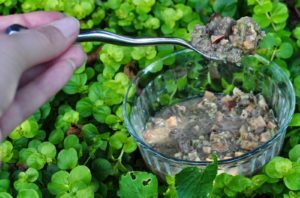 What a flavorful and healthy dog food. I am so glad to add this new raw dog food to my meal routine. It was wonderful. 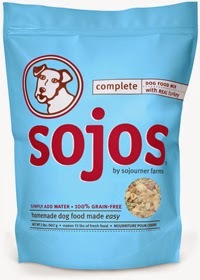 Sojos Complete Turkey Dog Food Mix is a great freeze-dried raw dog food diet. Because I travel a lot with Mom, this will likely be something we pack for road trips. Not only can it be fed in a stainless steel or ceramic dog food dish, but you can also use it to stuff hollow treat toys! You can learn more about that by clicking Mom’s article-How to stuff a hollow treat toy. Now is the time in the dog food review to talk about all the health benefits of Sojos Complete Turkey Dog Food Mix. 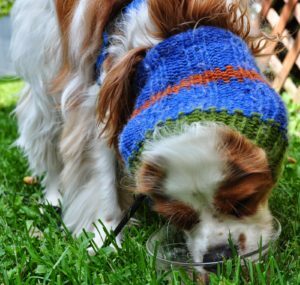 A wholesome grain- and gluten-free product that you simply combine with water to create your own fresh, homemade dog food. Uses fresh, raw food. Made with USDA FREEZE-DRIED raw turkey and other all-natural ingredients. The freeze-drying process is slow and low so that all natural enzymes are carefully protected. No GMOs, fillers, preservatives or artificial colors or flavors. No ingredients from China, this is made in their own factory in the USA. Sojos Complete Turkey Dog Food Mix is a big hit with me! I’m so glad Sojos sent me some to try. Thank you! Is your dog or cat a turkey fan? Tell me in the comments.